Think of your mane as a garden. How beautiful the garden grows depends on what happens underground; similarly, how beautiful your hair strands are depends on what happens in their roots or on the scalp. Hairs grow and shed in a cycle. The cycle is important. Even a slight change in the cycle produces significant effects. Things that meddle with normal hair growth cycle include illness, mental or physiological trauma, infection, medication, and chemicals. These things have the power to not only decline hair health, but also completely stop hair production. So, beware! Your mane is a dynamic place. Anything that makes the hair growth cycle go awry can lead to hair loss or unattractive hair. Is it really hair loss? Now … before you begin looking for a hair loss solution, ensure that you actually are suffering from hair loss. 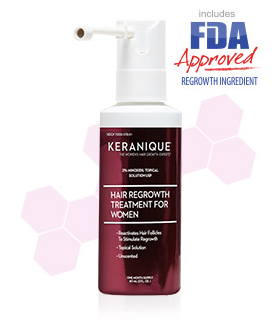 Brands like Keranique are designed to give hair a voluminous, healthier look. So, despite of your hair thinning condition, you can flaunt fuller looking hair. According to American Academy of Dermatology, losing up to 100 hair strands a day is normal. You need no exclusive hair loss treatment. Trichologists even say that it is normal to shed up to 250 hair strands while shampooing. In case your mane appears limp or damaged, you can use Keranique’s products that are meant to add bounce and gloss to hair. To make sure whether you are truly suffering from hair loss condition is to observe your pillow when you wake up in the morning and your comb after combing hair. If there is an abnormal number of strands on the pillow or a large number of strands are pulled out when you comb hair gently (without jerks and tugs), and when this continues to happen for more than 3 weeks, then you are in need of a treatment. This is long-term hair loss, which is generally known as Androgenetic Alopecia. It could also be short-term hair loss, or Telogen Affluvium, which indicates your follicles have gone into the resting or telogen phase for longer than normal. This is usually caused by a “shock to the system”; for example, surgery, pregnancy, a traumatic event in life that causes extreme mental stress, major illness, high fever, crash diets, and menopause. Follicles go into “shock.” They stop growing hair. The other hair that complete their life cycle shed without being replaced by new hair. This leads to a thinning of the mane. The condition can be acute or chronic. Generally, it goes away within 6–8 months; if it does not, you may need hair loss treatment like Keranique. · It is approved by the FDA. · It uses one of the most potent hair-growing compounds — minoxidil. · The treatment is easily available online. · It is okay for the pocket. · It suits all hair types. · It suits women of all ages above 18. In case you are confused about your hair condition, consult a hair expert. He or she will tell you what exactly your hair condition is and whether it really is hair loss. In case your hairs are in bad condition, you can always grab a bottle of Keranique shampoo & hair products and transform your mane miraculously. Keranique.com offers full range of Keranique products. You simply need to visit the official website to place an order for Keranique shampoo & hair products.